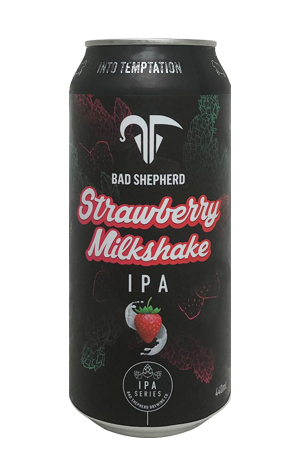 Bad Shepherd's IPA series has headed in a fair few directions already although, arguably, the first for 2019 is the one veering furthest from where the ever-expanding IPA style category started out. Indeed, if 2018 was the year in which Australian brewers and drinkers went crazy for the hazy, it looks like we're in for plenty of fruity and creamy this time around. There's plenty that's gone into this beer: flaked oats, apple puree, wheat, 100kg of lactose, whirlpool hops in the shape of Citra and Mosaic followed by more Citra plus Barbara Rouge and Huell Melon in the fermenter, into which was also added 600 litres of strawberry puree, a pinch of vanilla and another dose of dry hopping. The result is a beer with a hefty haze in which the aroma mixes a creaminess with a bit of berry tang and some grassy, fruity hop characters. Given how late the hops were added, we're told the IBU count sits just 25 yet, combined with that tanginess from the fruit editions, what bitterness there is provides a welcome counterbalance to the sweetness supplied by the lactose and vanilla, ensuring the IPA tag remains as relevant as the strawberry milkshake of the title (although, if we being picky, it's arguably more berry pavlova than milkshake…).